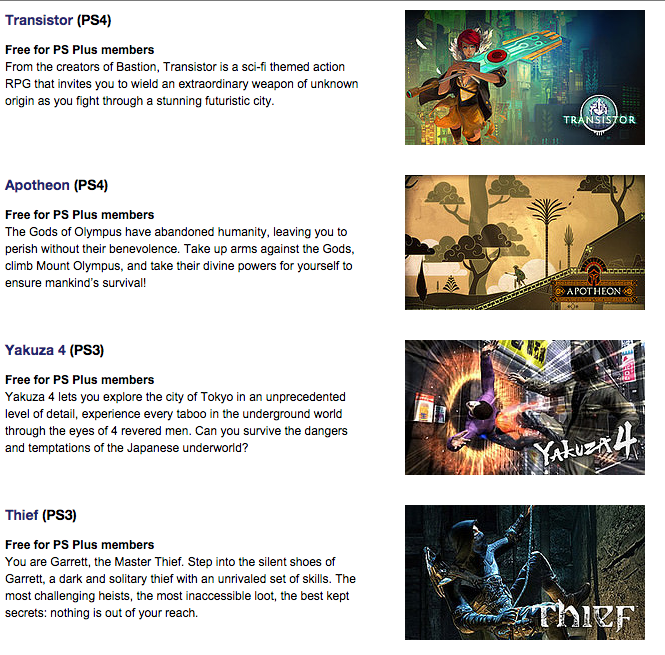 As you may have already seen, PlayStation has announced the February 2015 PS Plus freebie lineup. It’s outlined fully on the PlayStation Blog post here, but I’ve shortened it for you on the DGCast website. I’ve never even heard of Kick & Fennick but PS Vita games are always welcome to me. Theif was never my style but I’m sure I’ll fire up the PS3 and check it out while I jam out on some Yakuza 4. Transistor and Rogue Legacy are probably the two leaders of the pack this month, but coming off of last month including inFamous First Light I think this is another awesome month of games. What say you? Tweet us @TheDGCast and let us know!